Step1. 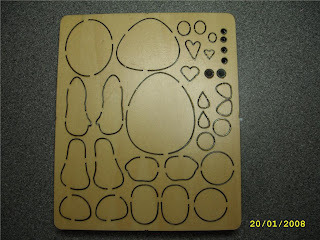 Use either dragon die or the bear die #7 cut the shapes shown in the first photo ,1 oval head, 2 medium ovals for the ears, 1 small oval for the nose, 1 egg shape for the body, 2 arms and 2 feet. You can use either from dragon die or the bear die #7 i used the bear die #7 for everything i cut out today. Step2. Shade all the pieces you have as i have done in the second photo, and add some patches on the bum and on the foot if you want to. Step 3 then put all the pieces together like i have done, you can add hair to the baby if you want too, and you can also chose to use the big hands from die '#7 or can have the small hand which ever you feel like using. lol...very good comment at the end!!! LOL @ how you make babies.